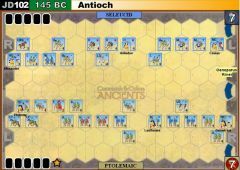 The Slaves made a push to the right and had a lucky start, eliminating a full strength legion with 4 hits in a single attack. They kept the pressure up, during a counter attack on the left flank, and secured the win. Last edit: 4 months 3 weeks ago by gottoman. 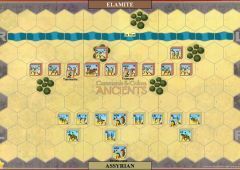 Slaves got going to the left with a Line Command and a Double time, cutting off and killing a LI and MI. 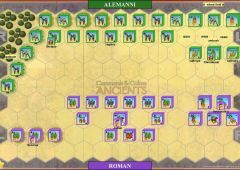 The Romans counterattcacked and killed W and 2 MI, but damaged 2 Roman MI who never saw battle again. 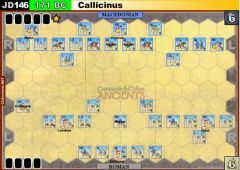 Slaves shifted further left with good cards ( 2 move mediums, move 4, and Spartacus) and eliminated the rest of that flank for the win. Romans are sitting ducks in this scenario if the Slave has good cards like those. Stormwalker was game, but odds were long for him. Thanks for match! Fast, swingy game with a crazy result appropriate for this strange scenario. 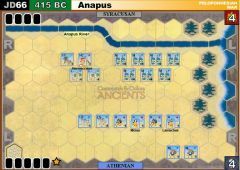 The Slaves made the expected first turn centre attack to take out the two encamped Roman leaders....and fortunately for me they both failed (a 2 leader kill here first turn must pretty well end the scenario). With my next card play I was able to get the leaders safely attached to units or so I thought. Fate was toying with me as a counterattacking Slave warrior took out one of my leaders on a double helmet. I assumed it was going to be a slaughter from there but the legions held firm behind their ramparts and camps. 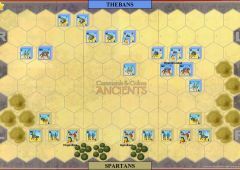 Spartacus was cut off and survived a leader escape only to find himself completely encircled by Roman units and killed next card play. Dan couldn't hit, I couldn't miss and it was all over in 20 minutes. A shame because Dan and I usually have exciting close matches but this is not that type of scenario. 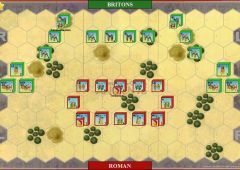 The Slave left advanced and looked very dangerous but the Romans held firm and surrounded and killed Spartacus on a leader escape. 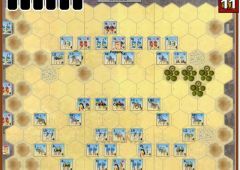 A Mounted Charge ended the Slave impetus and with both sides depleted on that flank, the action there wound down to desultory ranged fire from the Roman war machine and Slave slingers. 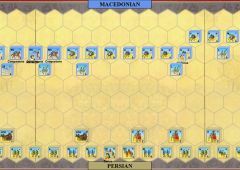 The remaining banners were obviously going to be won on the Slave right, which had seen almost no orders to that point. The war machine there did some damage, then the legions grouped and pulled off two consecutive Double Times I'd been holding to pin the Slaves and end it. An entertaining game, thanks Greg. No Slaves escaped and I managed to forget only once that I couldn't order units in both armies (which was pretty good, I thought . it is the sole Rolling burning logs scenario as far as I can tell. Game started with Slave manuevering slowly to right. Missile fire exchanged causing damage and a Roman LC to flee board then Romans ventured from the walls and killed a LS, and then their wheels fell off. 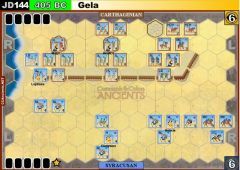 Had initial attack rolls whiff terribly followed by good bb left Roman leaders exposed in ditch. Warrior counterattack counterattack decided game with eliminating Roman MI and leader roll and 2 hits on evading MC with double leader roll for 3 banners won on last turn. Terrible luck for Togan who is facing minor surgery. Get well soon buddy! A really tense, good game. 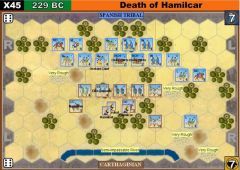 I started with a disappointing hand (Command Heavy, 3 Order Lefts) but was able to gradually cycle and inch my centre to the Roman right, away from Spartacus, forcing him to advance out of the safety of the hills and forest there. I occupied one camp but never gained the second. After a slow, patient buildup, the battle heated up spectacularly. Spartacus and his warriors Double Timed into my stretched centre. 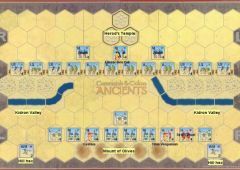 I responded with my one decent centre card, Inspired Centre Leadership, held for this point and managed to surround Spartacus and force a leader escape through two Medium Infantry....which failed! The Slaves responded with a Clash of Shields that did major carnage and I thought the scenario was going to live up to its name. But a Mounted Charge took out two 1 block Warriors and I managed to hold out to get the last banner next turn. I think I had four 1 block units at the end, a testament to how close it was, and it could have gone either way. Thanks Joe, for another very enjoyable encounter and well played. Disappointingly, for such a great game, there was an error and my log file wouldn't save (never encountered that before). Joe, if you have a complete log and want to upload it, that would be great. Last edit: 4 months 1 week ago by g1ul10.